Thanks to the flow of ever-questionable words flowing from his mouth, John Schnatter’s role as a leader of Papa John’s Pizza, the company he founded in 1984, is officially over. Late Wednesday night, he tendered his resignation as chairman of the word’s fifth-largest pizza chain, a move following his resignation from the University of Louisville’s Board of Trustees earlier in the day. Both withdrawals came on the heels of his use of the “n-word” during a role-playing press conference—which, ironically, his company’s PR team had set up to help Schnatter tame his tongue. That now-wasted effort was in response to a similar misuse of his mouth last year when speaking out negatively about the National Football League not stopping its players’ protests of pre-game National Anthem singing. That misplayed card saw the pizza chain’s longstanding and profitable sponsorship-relationship end abruptly, and triggered an ongoing slide of Papa John’s normally rock-solid stock. To any reporter who’s interviewed Schnatter, his abrupt departure is as surprising as it isn’t. 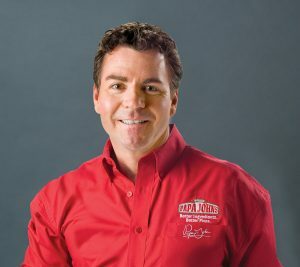 Teflon John has always said too much, commonly criticizing people within his company, its franchisees and nearly always those who left Papa John’s to work elsewhere. And yet, as constant and uncomfortable as his words were, it never seemed to hurt him, never seemed to jeopardize his status as the iron-fisted ruler of the pizza empire he created. But in what the now-infamous Forbes.com story reported about Schnatter’s use of the “n-word” to articulate Col. Harland Sanders constant use of it, his stepping down doesn’t surprise me a bit. I have no sense whatsoever that Schnatter—whom I’ve interviewed at least a dozen times—is a racist. What I know for sure is he lacks an understanding of conversational propriety and nuance, which necessitated a company gatekeeper be on hand to monitor most conversations we had. With some regularity he struggled to tap his mental brakes when an inappropriate thought arrived at his vocal chords. I got my first glimpse into how often Schnatter did such things the first time I met him at a PR event staged by the company. Discussing a controversy with another pizza chain, he indulged in a bit of name calling that was truly petty. Knowing I wasn’t going to report it, I still called a high-level Papa John’s official to share that mouth bomb in hopes he’d guide his boss not to repeat it. When the person’s secretary told him who was calling, he simply picked up the phone and asked, “OK, what did he say now?” He was obviously used to the drill. I told him and he thanked me. And, as expected, he rewarded me access to Schnatter and other Papa John’s officials for years to come. Enigmatically, there were years when Schnatter acknowledged in private interviews that he’d been too hard on his franchisees. As pizza sales lagged category-wide in the mid-1990s, he criticized them publicly in analyst conference calls. Years later, when the company was back on course, he accepted some of the blame, saying the company had made some mistakes like signing on franchisees who were well heeled-enough to land a Papa John’s franchise, but who had no interest in or skill for store-level operations. Such concessions were rare, of course, and just when outsiders like the press were getting used to a humbler Schnatter, he’d resume firing off bracing and critical comments. Over the years I covered the company, such swings just became de rigueur. But his April 2017 resignation from the U of L Athletics Board seemed to signal trouble was coming: I couldn’t tell if he was taking a principled stand regarding the unfolding mess within the university’s sports department or just storming off in a huff because the legendarily opinionated and forceful leader wasn’t getting his way. Then came last year’s dustup with the NFL—definitely the point when it became clear that Teflon John had stepped in it up to his knees. By saying the NFL’s lack of control of its players was harming TV ratings and, ultimately his company’s sales, he’d gone too far. Offending his highest-profile sponsorship partner and powerful, popular black athletes to boot was monumentally unwise. So, when I read the Forbes.com story yesterday, I wasn’t surprised at all. It was proof that Schnatter has yet to learn to say little, say less and—if at all possible—say nothing questionable when reporters are near. Should the Forbes reporter have ignored what Schnatter said, like I did 19 years ago? Not in 2018, and not when the reporter was among others who heard it as well. Someone listening needed to hold Schnatter accountable for that. Fact is, reporters, Papa John’s officials and employees—not to mention loyal friends who grumble about him quietly—have grown bone weary of Schnatter’s negative bloviating. Hopefully for Papa John’s Pizza, this will put a stop to it. It seems to happen when one starts thinking they are just a little notch above everyone else. They seem to forget their fortunes are largely a result of others hard work. Big heads get you in trouble every time.